The prevailing view (a regional median of 50%) is that Muslim women should be allowed to wear religious clothing as long as it does not cover their face. Fewer (regional median of 23%) say Muslim women should not be allowed to wear any religious clothing. And a regional median of 25% take the more permissive view that Muslim women should be allowed to wear any religious clothing they choose. In the United Kingdom, for example, 53% of non-Muslim adults say Muslim women in the UK should be allowed to wear religious clothing as long as it does not cover their face, while 19% favor restricting all religious clothing. Roughly a quarter (27%) support allowing Muslim women to wear the religious clothing of their choosing. The recently enacted laws in European countries do not explicitly target Muslim women’s dress. 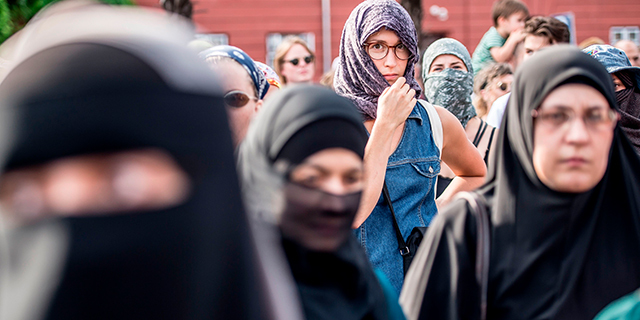 In the case of Denmark, for instance, the statute prohibits face coverings except for “recognizable purposes,” such as cold weather. Proponents of the recent laws point to public safety and other reasons for the measures. Opponents say the laws are unfairly directed at Muslims and that people should have the freedom to wear what they want. Overall, most people in Western Europe say they accept religious minorities – Muslims included. For example, a median of 66% of non-Muslim adults in the region say they would accept a Muslim as a member of their family, according to a separate question in the recent survey. Yet even among non-Muslims with positive feelings about Muslims, large shares in most countries still favor banning face coverings. Among those who say they would be willing to accept a Muslim in their family, a median of 55% support banning facial coverings, and this includes majorities in Germany, the United Kingdom, Austria, Switzerland and the Netherlands. This is not the case in every country, however. For example, about six-in-ten Portuguese adults with these positive feelings about Muslims favor no restrictions on religious clothing. Among Western Europeans who say they would be unwilling to accept a Muslim in their family, there is relatively significant support for banning all religious clothing. For example, in France, 43% of those who would not want Muslims as relatives support a total ban, compared with only 16% among those who are willing to accept Muslims in their families. Ariana Monique Salazar is a research analyst focusing on religion at Pew Research Center.